Inventory We are a resale marketplace, not a box office or venue. Ticket prices may exceed face value. This site is not owned by Raymond James Stadium . 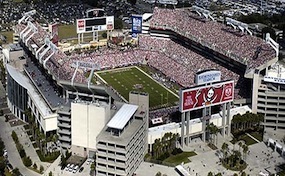 Raymond James Stadium, also known as the "Ray Jay", is a multi-purpose football stadium located in Tampa, Florida. It is home to the NFL's Tampa Bay Buccaneers as well as the NCAA's South Florida Bulls football team. The stadium seats 65,857, and it is expandable to 75,000 for special events. The stadium also hosts the annual Outback Bowl on New Year's Day the annual pinnacle of USA equestrian show jumping, the AGA/Budweiser American Invitational; and the Monster Jam monster truck event after the end of football season in January or February. Raymond James Stadium hosted Super Bowl XXXV on January 28, 2001 between the Baltimore Ravens and New York Giants and Super Bowl XLIII on February 1, 2009 between the Pittsburgh Steelers and the Arizona Cardinals. RaymondJames.StadiumTampa.com is not a primary vendor, supplier, or affiliated with any official website. We proudly provide access to a large supply and low prices online for all secondary market events. Ticket prices may be well below or above face value and will fluctuate with the market. To purchase tickets for all Raymond James Stadium Tampa Events simply click on the show of interest or call our operators at anytime.